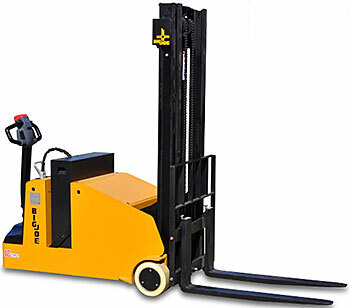 HOF Equipment Company carries Electric Pallet Stacker models with Manual Drive & Powered Lift AND Powered Drive & Powered Lift. Electric Pallet Stackers may be further segmented into models with Adjustable Forks & Legs (straddle) AND Fixed Forks & Legs (fork over). Counterbalance Pallet Stackers feature a counterbalance weight instead of front support legs for balance. Electric pallet stackers are an essential tool for factories, warehouses, and shop floors where pallets, skids, or totes need to be moved from place to place and/or racked. They are ideal for loading and unloading trucks when a loading dock or forklift is not available. HOF Equipment Co. offers a vast selection of manual push / powered lift and fully powered (drive & lift) pallet stackers. All stackers are plug and play and come standard with batteries and integral battery chargers. Electric straddle stackers feature adjustable width legs allowing the legs to go around the outside of a standard pallet while the forks go into the pallet. Lift heights vary from 62’ up to 177” and lift capacities range from 1,500 LBS to 4,000 LBS. Counterbalance pallet stackers do not have front straddle legs allowing the stacker to operate in narrower areas. Our goal is to help our customers find the perfect powered pallet stacker to meet their needs. Give us a call now at 888.990.1150 or browse all our stackers with full specification detail and photos on our website!